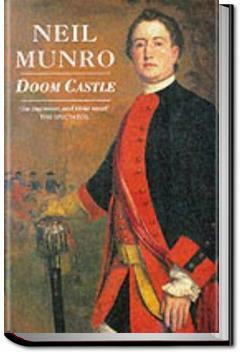 Doom Castle is the story of young Count Victor's journey to Scotland after the Jacobite Rebellion, searching for a traitor to the Jacobite cause as well as a mysterious man under the name of "Drimdarroch", whom he swore revenge. After a perilous journey, Count Victor arrives at Doom Castle as a guest of the enigmatic Baron of Doom, his two strange servitors and his beautiful daughter. . . .Count Victor upon an immediate removal from this starven castle and this suspicious host. But when he joined Doom in the salle he constrained his features to a calm reserve, showing none of his emotions. He found the Baron seated by the fire, and ready to take a suspiciously loud but abstracted interest in his ramble. "Well, Count," said he, "ye've seen the castle of the King o' the Hielan's, as we call him, have you? And what think ye of MacCailen's quarters?" Montaiglon lounged to a chair, threw a careless glance at his interrogator, pulled the ever upright moustache, and calmly confessed them charming. "Doom Man behauld the end of All. Be nocht Wiser than the Priest. Not as engaging as Munro's The New Road, which I loved. This is a historical novel, first published in 1901, set in 1755 about a french count who comes to Argyll seeking revenge. There are some fascinating characters and some exciting scenes but overall I found the story a bit too sentimental.